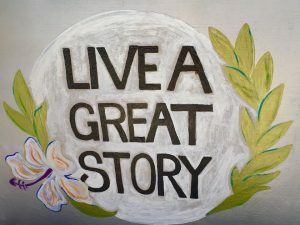 In talking with my students about living a great story, I simply asked, “What parts of our story can we control and what parts of our story are beyond our control?” Several shared that anger sometimes gets the best of them and they are not able to control it. For this reason, every day after recess and lunch, we find the space to stop, be still, breathe and release. One day, during this period, a dear friend and former opera parent, Lissa James, came to class to lead us in a guided imagery session intended to help us recognize and confront our anger. Through story and vivid images, company members became conscious of their anger dragons. Now, the goal is to determine ways to control this unpredictable beast that appears time and time again, catches us off guard, wreaks havoc in our lives and often leaves us feeling defenseless and defeated. Where does my anger dragon live? What is his motivation? How will I control him? These are questions we all might ask ourselves. On day one, I presented the incoming company members with the directive, Live a Great Story. I simply asked, “What does this mean to you?” Their responses, so authentic and introspective, launch our year-long journey of discovery. For years, teachers have engaged in taking running records to assess reading progress. Teachers analyze mistakes, determine strategies to help students correct mistakes and create an instructional plan of next steps to help students become proficient readers. When used correctly, this tool can provide great insight into teaching and learning in a profound way. The first week of school, my former colleague, Ellen Bloom, came to my class to teach students how to monitor their own reading progress by administering running records. Why should the teacher be the sole proprietor of the assessment tool and the process through which students learn to be better readers? As students learn to monitor their own progress and the progress of their peers, they better understand themselves as readers and for the first time, can unlock the meaning to the printed words on the page. The words come to life. It all begins to make sense. Since Ms. Bloom’s visit in September, my students have persevered in their efforts to become proficient readers. They coach one another and provide unsolicited assistance and support for fellow readers. When we turn over the responsibility of learning to our students, they do not disappoint. Before attending our school choir and band concert last week, I knew it was important to discuss “audience etiquette.” So, as we do in teaching many concepts and ideas, we presented a metaphor to help us better understand our significance as members of an audience. Each company member took a domino and gently placed it on the carpet, standing up right, one next to the other. I asked the class how these dominoes represent us. A discussion ensued. Then, someone tapped a domino and the rest fell in succession. I asked again how these dominoes represent us. The discussion continued and all came away from the conversation thinking a bit more about how one affects the whole. The next day, we revisited this theme and wrote what we were thinking. If we could harness these thoughts and keep them tucked inside us as reminders of how everything we do affects someone else, our actions might be different and our world would certainly be.